Recognizing the necessity of transforming the world the United Nations agreed on 17 Sustainable Development Goals which should be achieved by the international community in the upcoming 15 years. Due to their direct links to a variety of SDGs (no. 1, 2, 3, 6, 12, 13, 14 and 15 in particular) production and consumption of groceries play a significant role in meeting these ambitious goals. But maybe Germany is headed in the opposite direction: The country is facing infringement procedures by the European commission as it violates agreements on reactive nitrogen levels in ground- and surface water. Whilst it is hard to trace hydrospherical or atmospherical nitrogen back to its original source, one of the biggest polluters is definite: The German agricultural sector is responsible for over 50 percent of the country’s total nitrogen fluxes to the environment also due to excessive fertilizer usage. Moreover, unbound reactive nitrogen not only causes eutrophication in waterways; threats to human health, biodiversity and climate are further consequences of disproportionate fertilizer handling nonetheless and cause external costs not yet completely comprehensible. So, who is to pay the price after all? Without obligation of publishing a nitrogen balance, neither farmers nor final consumers are held accountable for their damaging surplus of nutrients. Consequences are insufficiently internalized follow-up costs which are to be paid by the public in unaffiliated ways. In an interdisciplinary approach we not only want to look at the matter from an ecological but also an economical point of view. Therefore, we work ambitiously for finding ways to quantify the German agricultural nitrogen loss and internalize occurring follow-up costs into the foods’ market price. Furthermore, we distinguish between four food categories as our research has shown great differences between the damaging effects of plant based produce and animal produce, as well as differences between organically and conventionally produced foods. Based on Van Grinsven et al. (2012) the public must bear the costs of 11.53 billion Euros per year for the German agriculture’s nitrogen loss. Even increasing yields due to the ground’s higher nutrien content cannot quite compensate all damaging effects of which the highest share is held by human health costs closely followed by the damage to various ecosystems. As mentioned before, it is essential for us to distinguish food categories by their environmental impacts and correctly assign arising costs accordingly. Organically produced foods only cause about one third of the arising conventional nitrogen surplus. After taking the yield gap into account – which makes up about 25 percent with lower organically farmed yields (Seufert et al. 2012) – and standardizing both parameters we estimated a damage factor of approximately 30 percent for organic agriculture and 70 percent for conventional agriculture. Using similar considerations for the two other food categories we determine the damage factor for plant based produce to be approximately 11 percent and for animal produce to be 89 percent. As we combine all four categories following damage factors are found: 3.12 percent for organic plant based produce, 7.39 percent for conventional plant based produce, 26.55 percent for organic animal produce and the biggest share of 62.95 percent for conventional animal produce. To eventually hold the nitrogen polluter responsible for causing external agricultural effects the previously calculated damage factors must be put into perspective of the categories’ production sizes or rather the general publics’ average expenditure for said categories. When standardizing the four categories again, following factors are found: 0.19 percent for organic plant based produce, 12.79 percent for conventional plant based produce, 1.27 for organic animal produce and again the biggest share of 85.75 percent for conventional animal produce. Earlier mentioned follow-up costs of 11.53 billion Euros can now be divided onto all four food categories. 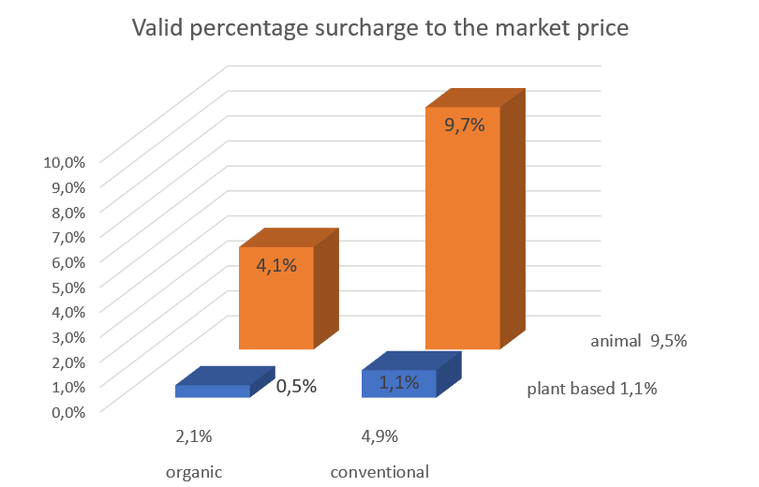 By including the polluter oriented follow-up costs into the current market price rather extreme differences can be seen between the rivalling categories shown in the picture below. This goes to show that not only market prices mislead the consumer in general with their gap to the true value of foods. Furthermore, the currently observable price gap between different food categories leads the consumer to buying ecologically problematic foods rather than making unbiased and educated decisions for their consuming behaviour. With that in mind it appears only reasonable to add resulting follow-up costs to the causing food categories accordingly. Removing such market failures should be one aim of various economic measures. Not only do nitrogen losses from agriculture cause follow-up costs and therefore price gaps on the market. We are only at the beginning of a great field of research and want to take further effects into account in the future, such as pesticide use, energy use, greenhouse gas emissions or phosphorus surplus. Our research strives to correctly estimate the overall follow-up costs while always being distinctive between different food categories. All further research in this topic is highly relevant to the current discussion, not only for Germany but also other developed and industrialized countries. Based on the Sustainable Development Goals and especially thanks to the engagement of the Paris Agreement we simply must not carry on with present agricultural high-performance practices and thereto relating forms of consume. We believe that spreading the word about arising market failure and the present agriculture will in the long run be beneficial towards a more sustainable foodstuff future. Further scientific exchange, which we accelerate through our working group “Markets for Mankind”, and interest in our compiled study is much appreciated. Van Grinsven et al. (2013): Costs and Benefits of Nitrogen for Europe and Implications for Mitigation. In: Environmental Science and Technology, 47 (8), pp 3571–3579. Seufert et al. (2012): Comparing the yields of organic and conventional agriculture. In: Nature, 485 (7397), pp 229–232. Gaugler et al. (2017): Was kosten uns Lebensmittel wirklich? Ansätze zur Internalisierung externer Effekte der Landwirtschaft am Beispiel Stickstoff. In: GAIA – Ecological Perspectives for Science and Society, 26 (2), pp 156-157.